In yet another signal that U.S. homebuilders are catching on to the value of technology in new homes, Lennar Corp. (NYSE: LEN), the second-largest homebuilder in the U.S., recently debuted a high-tech community in Orlando with standard amenities such as rooftop solar, home automation and wall-to-wall connectivity as standard features. 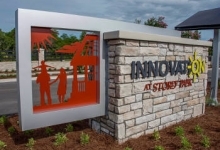 The community, named Innovation at Storey Park, is a gated enclave of 144 new homes with prices starting from the $270,000 range. It features Lennar’s “Everything’s Included” standard amenities policy, which has quite a bit of technology.